Episode 112 is made up of photography we provided for CESBA's (The Canadian Emergency Services Boxing Association's) 2011 Police Memorial, known as "Ringside For Kids". At this annual event, held in Mississauga, Police and Peace Officers from across Ontario step into the boxing ring against each other to raise money for charity, in honour and remembrance of the brave officers who lost their lives in the line of duty while protecting their communities and our nation. To find out more about CESBA, please visit www.CESBA.ca. Fashion Week took place in Toronto recently. Simply put, it blew us away! It is a completely different experience being in attendance at a runway show than seeing it on tv. The atmosphere in the room can be downright electric, and it makes for some incredible videography. In addition to filming many runway shows we also interviewed a great designer backstage and interviewed numerous interesting people we met at the show. The full videos of these shows and interviews can be found on the YouTube page of our friends from "The I On Fashion". You can check it out here. In this video we'll take a look at some of the highlights from Fashion Week, including the models getting made-up backstage and then strutting their stuff in some of the best runway shows of the week. Enjoy! We're back for more at The Royal Agricultural Winter Fair, Canada's most prominent agricultural event and the world’s largest indoor agricultural and international equestrian competition. We'll see the immense cow section where a huge number of cows are getting washed and shaved for judging. Then it'll be onto the bird-judging area, for a look at all manner of fowl. Finally we'll finish with a look at some of the other interesting exhibits at the fair, including some giant pumpkins. Enjoy! The Royal Agricultural Winter Fair is an annual fall fair in Toronto which takes place over two weeks every November on the grounds of the CNE. Inaugurated in 1922, it is Canada's most prominent agricultural event and has become the world’s largest indoor agricultural and international equestrian competition. The fair brings together over 300 vendors, 340,000 visitors, elite Canadian and International breeders, growers and exhibitors, over 4,500 large and small animals, a large petting zoo, the President's Choice SuperDogs show, shopping, dining and – of course – The Royal Horse Show. For those of us who grew up nowhere near a farm, the Royal Winter Fair is a blast! It is so interesting to see farm folk displaying their animals (horses, cows, sheep, pigs, ducks, geese, chickens, turkeys, llamas, and much more) and their crops -- and all this happens very near Toronto's downtown core. There is so much to do and see, and it is the prefect spot for families and school groups. Everywhere you look you will find wide-eyed children, squealing with happiness, as they see and touch so many different farm animals. In this first of two episodes from the Royal Winter Fair we'll visit an equestrian jumping event in the Ricoh Coliseum and then head into the sheep & goat areas to watch a lamb-judging competition. From there we're off to watch kids excitedly enjoying the petting zoo and watching a mother pig feed her babies. The it's off to the Horse Building where we'll see riders practising their equestrian skills and we'll wander around the massive amount of horse stalls that are full of these amazing animals. In part 2 from the Royal Winter Fair, we'll head to the immense cow section where a huge number of cows are getting washed and shaved for judging. Then it'll be onto the bird-judging area, for a look at all manner of fowl. Finally we'll finish with a look at some of the other interesting exhibits at the fair, including some giant pumpkins. Stay tuned! In this episode we'll get a look at The Badlands on a weekday when there are very few people visiting the site. We'll view the unique red and white hills (from a respectful distance) that make up this amazing place. In this episode we'll join the Bruce Trail on the path up to the top of Mount Nemo, in the town of Milton, about a 30 minute drive from Mississauga. Mount Nemo is one of the higher spots on the Bruce Trail. The trip includes a climb up a wooden ladder to the top of the cliffs. Then we'll walk the path through glades and forests brimming with autumn colours, all the way to the Brock Harris Lookout. You'll see plenty of families enjoying the trail and all the colours and sites on this nice autumn day. The views from atop the cliffs are dramatic -- you can see all the way to Toronto and Mississauga. This is a great place for families and casual hikers! From 1890 to 1980, the Don Valley Brickworks was one of Canada's pre-eminent brickyards. At its peak more than 43 million bricks a year were manufactured for use in the construction of homes and buildings across Canada. Many of Toronto’s most prominent buildings were made from Don Valley brick – Massey Hall and Old City Hall are two examples. In the late 1980s the site was expropriated by the City of Toronto, the TRCA (the Toronto and Region Conservation Authority), and the Provincial government. In the 1990s the City and TRCA raised approximately $6 million to restore the site’s quarry as a park and natural area. The Don Valley Brick Works Park is awe-inspiring: a haven for wildlife and naturalists alike, it is at the heart of Toronto’s ravines. Opened in 1996, the park is managed by Toronto Parks, Forestry and Recreation. The Don Valley Brick Works Park is worth a visit in any season. Evergreen’s focus has been the site’s 16 historic factory buildings. The buildings – a collection of brick structures from the early 1900s and industrial sheds from the 1950s – have been revitalized through a process called “adaptive re-use.” The result is Evergreen Brick Works – a community environmental centre with programs that celebrate the site’s unique geological, industrial and natural heritage. In 2010, Evergreen Brick Works was named by National Geographic as one of the world’s top 10 geotourism destinations. The site will be animated with year-round programs and activities that include a native plant nursery, demonstration gardens, an organic farmer's market, conference and event facilities, youth leadership and children's camps, and family programming. The new office building on the site will be LEED Platinum and will showcase environmental techniques like green walls and a green roof -- it will be one of the "greenest" buildings in the Western Hemisphere. In this episode we'll begin in the main centre and then venture out back to the old brick quarry that is now a pond filled with wildlife. Finally, we head inside the old brickwork factory to see the restoration efforts and to view the incredible graffiti that covers the walls and brick ovens. The John Street Roundhouse is a preserved locomotive roundhouse in downtown Toronto, just steps from the CN Tower and the Skydome. It is the largest roundhouse in Canada. Built for the Canadian Pacific Railway (CPR) in 1929 to replace the earlier roundhouse built in 1897, the building was last used for its original purpose in 1986. It is now the only remaining roundhouse in downtown Toronto. One third of the original structure was dismantled, to allow construction of the Metro Toronto Convention Centre below, then reconstructed in 1995 and is now home to The Toronto Railway Heritage Centre (TRHC), Leon's Furniture and Steam Whistle Brewing. The roundhouse originally had stalls for 32 locomotives that were moved in and out of the structure on a massive 120-foot rotating turntable designed by the Canadian Bridge Company. Locomotives were driven onto the turntable and rotated for positioning into one of the stalls for servicing and light repairs. In its prime, the John Street engine facility contained 43 structures, several miles of track and covered nearly 16 acres of property. Up to 150 men worked in the facility 24 hours a day. The 17-acre park includes four full-sized locomotives dating back to 1944 as well as Toronto’s own car, No. 1, built in Kingston, Ontario in 1950. There are also three freight cars and two passenger cars in the park. The roundhouse has been cleaned up and bays 15, 16, and 17 have been set up by the Toronto Railway Historical Association as a simulation of what it’s like to drive a real diesel train. Another interactive component of the Heritage Centre is the Roundhouse Park Miniature Railway. A fully operational miniature train can carry up to 24 people around the park. In this episode we'll watch as hundreds of people enjoy the roundhouse on a beautiful summer day. You'll see people riding the roundtable that used to turn locomotives around. You'll also see kids working an old pushchair. We'll head inside to take a look at a few of the engines that are preserved by the TRHC, and then go back outside to get a good look at the families enjoying the trip through the park on the miniature train. This is definitely a great place for families, historians, and train lovers! Osgoode Hall opened in 1832 and remains a Toronto landmark and the hub of legal life in Ontario. It currently houses the Ontario Court of Appeal, the Divisional Court of the Superior Court of Justice, and the Law Society of Upper Canada. The building also housed the Osgoode Hall Law School until 1969 when the faculty was relocated to the campus of York University in the North York community of Toronto. The six-acre site at the corner of Queen Street West and University Avenue was acquired by the Law Society in 1828. At the time, the location was on the northwest edge of the city, which has since grown around the building. The building now sits in the heart of downtown Toronto. Between 1838 and 1843, the hall was turned into troop barracks. When the Law Society regained possession in 1844, an expansion was designed and the West Wing and Library were built. From 1855 to 1857 the building was refurbished and enlarged again to accommodate courts with the original 1829 building becoming the east wing. From 1880 to 1891 the building was again expanded twice in order to accommodate the law school. Despite the expansions, the hall presents a unified design in the Palladian style. The iron fence surrounding the lawns of Osgoode Hall has become a landmark in itself. Its distinctive iron gates are narrow and restrictive; it is a long-standing myth that they were designed to keep livestock out of the grounds of the hall and in the 1950s students did attempt to pass a cow through one of the gates (they failed). The gates were likely due to Victorian architectural fashion, rather than wandering cattle. Two libraries are housed within Osgoode Hall: the Great Library of the Law Society of Upper Canada and a smaller library for judges. A War Memorial was added to the library in honour of the Canadian war effort. Behind the Great Library is the American Room, a more intimate room with a spiral staircase. In this episode we will get a look at the building's facade before venturing inside. We'll see the Rotunda with its ornate tile floor and the memorial statue in the middle of the room. Then we'll head further inside to see the spectacular Great Library and American Room. We'll see smaller rooms like the Bencher's Reception Room and the Convocation Room before entering another grand room, Convocation Hall. We'll finish by visiting the courtrooms and watch as people from all over get to take their turn behind the bench. One of Toronto's most recognizable and well-known buildings is the Canada Life Building on University Avenue in the heart of downtown Toronto. The fifteen-floor Beaux Arts building opened in 1931 as the headquarters for Canada Life, Canada's oldest (and at the time largest) insurance company. The building is 321 feet (98m) high, including it's famous weather beacon (more on that in a minute). It's imposing nature was meant to symbolize the company's stability. The building was the first of a series of planned structures along University Avenue, but the Great Depression halted these plans. When it was completed it was one of the tallest buildings in Toronto and the British Commonwealth. It remains one of the largest office buildings in Toronto, with windows that can still be opened by its occupants. The building is perhaps best known for its famed weather beacon which was installed in August 1951. The beacon flashes green for clear weather, red for cloudy, flashing red for rain, and white for snow. Lights affixed to the support tower indicate variations in temperature (eg. getting warmer or colder). The beacon is intended to provide onlookers with "weather predictions at a glance". The information is updated four times daily, seven days a week, by Environment Canada's Weather Centre at Pearson International Airport. In this episode we will start by getting a look at the outside of the imposing building, followed by a look inside its impressive lobby, which has many features including decorative ceilings and floors, columns and trim made of various types of marble, and a working model of the weather beacon. Then we'll be off to a rare opening of the 17th floor Tower Room, which overlooks downtown Toronto and is only open once a year. Even employees of Canada Life can only see this classic room once a year. The room was built to be an executive boardroom and to host events for the company, but is no longer in use. Luckily, it is open for the Doors Open Toronto weekend each year and the views from the windows of the Tower Room are impressive, as you will see. We will look south through the canyon of large building on University Avenue, west overlooking the OCAD building and the Art Gallery of Ontario, and east to look down on Osgoode Hall (the subject of the next episode of TLTV). Since it is such a great space yet is only open once a year, the crowds in the room and waiting for the elevator down below can get very big very fast, so I got there early to give you the best view possible. Enjoy! Rattray Marsh is an "environmental gem" located in a unique natural setting within the City of Mississauga . As the last remaining lakefront marsh between Toronto and Burlington , this environmentally sensitive wetland is home to a variety of wildlife and plants and a definite must see for avid bird watchers, photographers and nature lovers. The CVC, along with local residents and other interest groups have implemented numerous trail upgrades in order to preserve the area's many sensitive features. Raised platforms allow for wider and higher pathways designed to keep visitors on the main trails and the natural areas undisturbed. The popular waterfront trail travels through the property but there is no cycling allowed in the conservation area. 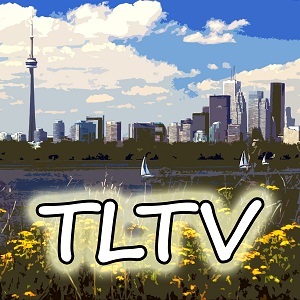 In this episode we'll start by checking out the view of downtown Toronto as we enter Rattray Marsh from popular Jack Darling Park. Once we enter you will soon see the large marsh that is the centrepiece of the park. We'll walk along the raised walkways throughout the marsh, seeing the stream that meanders through it and the Canada Geese that call the marsh home. You'll also spy a bit of the very pricey real estate that is located on the strip of land between the marsh and Lake Ontario. Welcome to TLTV's 100th episode! I'm glad you are with us and hope that you have enjoyed yourself so far. I've got much, much more of The GTA to cover, so stay tuned! In this episode we are going to take a look at two new additions to Toronto's waterfront -- The Wave Deck and HtO Park. Toronto has always had a spectacular view of Lake Ontario, but it's waterfront has historically been neglected. People wishing to spend time by one of the largest lakes in the world instead have found industrial storage lots, refineries, and lots of garbage. All that started to change a few years ago, and the latest additions are helping to bring people back down to the waterfront. The Wave Deck is one of three planned wave decks for the waterfront. Judging from the smiles on the faces of the kids sliding down the slopes of the Wave Deck, it's a smashing success. Aesthetically, the Wave Deck's design is meant to mirror the waves of the lake as well as the curvatures of the shoreline, but try telling that to the kids in this video! They are simply enjoying themselves, and that's what it is really all about, isn't it? Also on today's agenda is a visit to another new addition to the waterfront - HtO Park. The park is an "urban beach" and is located just steps from Harbourfront Centre. The park begins with rolling green hills and a few trees, with paths meandering throughout. The paths lead to the park's standout feature -- a large sandpit that holds Muskoka chairs and enormous yellow metal umbrellas. At night the hills of the park are nicely illuminated by lights. With a spectacular view of Lake Ontario and the Toronto Islands to the south, as well as the CN Tower and Skydome to the north, HtO Park is nicely situated. The only drawback is that swimming is not allowed in the park, but that doesn't seem to matter to the huge number of people enjoying the park on the day I experienced it. There were simply people everywhere -- sunbathing, throwing a frisbee around, or just having a family picnic. After many years of neglect, Toronto's waterfront is starting to become the kind of place that people want to experience. Let's hope that the city keeps adding new and exciting things to the waterfront for years to come. Located in the Cabbagetown area of Toronto (more on that in a future episode of TLTV!) the Necropolis Cemetery is likely the oldest remaining cemetery in The GTA. Comprising 18 acres, it was opened to replace the Potter's Field which was located on the north-west corner of Bloor and Yonge Streets and had simply become too crowded. The first interment in the Necropolis took place on May 22, 1850. Within these ground are buried many of those originally interred in Potter's Field including citizens in every walk of life and some who occupied positions of eminence in the city. The present chapel, and lodge were built in 1872. The crematorium, the first in Ontario, was opened in 1933. In the grounds are numerous interesting memorials and many unusual species of trees and shrubs. The cemetery has a lonely, slightly eerie feel even at midday. That is likely because of the large old trees that provide lots of darker shaded areas as well as a number of secluded small valleys throughout the grounds. Even so, this place is definitely worth the trip. As you will see in the video it is full of beautiful old reminders of long ago. Edwards Gardens is a botanical garden located on the southwest corner of Leslie Street and Lawrence Avenue East in Toronto. It is a former estate garden featuring annuals, roses, wildflowers, rock gardens, secluded pathways, a waterwheel, gazebos, a gift shop and picturesque bridges over Wilket Creek, one of the tributaries of the Don River. The park's manicured lawns and well kept flower beds make it a popular destination for wedding parties to take photographs. The estate's title was once held by Alexander Milne, a Scottish weaver who settled here after the War of 1812, and left in 1832. The land and the woolen/saw mills were obtained by Rupert E. Edwards in 1944, who created his country home. Edwards home was left in neglect and was purchased by the Municipality of Metro Toronto in 1955 and became Edwards Gardens in 1956. Also on the site is the Toronto Botanical Garden, a private not-for profit organization previously called the Civic Garden Centre. In 2006, the Toronto Botanical Garden (TBG) opened a series of 12 contemporary themed gardens spanning nearly four acres. These unique green spaces are designed for Torontonians and visitors to enjoy and engage in the splendour of nature, while learning practical applications for their own gardens. The gardens reflect the scale of a typical urban setting, making it easy for visitors to translate the ideas presented into their own gardens. The gardens are open year-round from dawn until dusk and admission is free of charge. University Avenue is a major north-south road in Downtown Toronto. It begins at the intersection of Front and York streets near Union Station and heads north, ending at College Street where it splits into Queen's Park Crescent East and West. Between these two roads is Queen's Park, the home of the Ontario Legislature. The building creates a terminating vista for those looking north along University. The legislature's site was originally home to the main building of the University of Toronto, and this is the origin of the avenue's name. Today, the university surrounds the legislature, but no university buildings are actually on University Avenue. The street also has a median of greenery and sculptures between the north and southbound lanes for most of its length. While Yonge Street is the emotional heart of the city and Bay Street is the financial hub, University Avenue is arguably Toronto's most prestigious thoroughfare. The boulevard is unusually wide for Canadian cities as it expands to 8 lanes wide. The northernmost part of the street is dominated by a series of very large hospitals. These include the Toronto General Hospital, Mount Sinai Hospital, Princess Margaret Hospital, Toronto Rehab, and the Hospital for Sick Children. This stretch is occasionally referred to as "Hospital Row" by locals and the Media. The intersection of University and College is also home to the headquarters of Ontario Power Generation. The rest of the street is home to a variety of corporate offices and provincial government buildings. Restaurants now dot the southern end of University Avenue. Recently completed at the intersection of University and Queen Street is the Four Seasons Centre, which is the new home of the Canadian Opera Company and the National Ballet of Canada. Osgoode Hall presents stately architecture and a welcome green space. During the holiday season, festive lights illuminate the trees and shrubs of the boulevard. Unlike most major streets in Toronto, there are no rooftop billboards visible from University Avenue due to a city bylaw. Yonge-Dundas Square (also known as Dundas Square) is a unique focal point of the downtown Toronto community, at the intersection of Yonge Street and Dundas Street, one of the busiest intersections in Canada with over 56 million people each year passing through this intersection. It is sometimes nicknamed "Toronto's Times Square". Constructed as a downtown 'revitalization' project, the square was created from the demolition of a block of commercial buildings and opened as a public square to the public in November 2002. The Square is designated for use as a public open space and is used for music concerts, film screenings and other public events. You'll discover a wide range of activities on the Square at any given time: community celebrations, theatrical events, concerts, receptions, promotions – events that appeal to residents and tourists alike. The centrepiece of the square is the array of ten fountains that are spread out across the main walkway of the square so that visitors have the opportunity to walk through or around the fountains. Unlike many other city fountains, the Dundas Square fountains were meant for waterplay. The fountains usually run from around mid April to the end of October. Hungry? If you are looking for a good outdoor patio in Toronto on which to sit, eat, and drink, well Baldwin Street has you covered! It is a small street located just two short blocks north of the Art Gallery of Ontario (AGO) and is the perfect spot to enjoy the summer weather over a meal or a drink. Baldwin Street is a relatively small street, hidden among the towers and hustle & bustle of Toronto's downtown, but it a great example of an urban oasis. It seems secluded and inviting. You will hardly believe that you are right near the downtown core. The restaurants all have great patios, and you can get a variety of foods, from Italian to Japanese to Thai to Indian to Vegetarian and more ... there really is something for almost everyone. Baldwin also has a number of unique little businesses, like a used record store, an art gallery and a small hotel. All are one-of-a-kind and are definitely worth checking out. If you have just come from a day at The AGO or are just in the Dundas Street West neighbourhood you should absolutely check out Baldwin Street. Few streets anywhere have so much character and charm in such a small area. The Eaton family, upscale owners of the T. Eaton Company department store chain, originally owned what was a 700 acre farm in King City, Ontario -- about a 30 minute drive from Toronto. The remodelled farmhouse on the property served the family for weekend barbecues and picnics, but Lady Eaton wanted a large country home and Eaton Hall was built by 1938, designed like a French chateau using the brownish-grey stones from the nearby Humber River. It is modelled after a Norman French chateau with rounded turrets and grand halls, and though it originally started as a summer residence and working farm it became a focal point for steeplechase days, hunter trials and a place for the Toronto and North York Hunt Club meets. During the Second World War Eaton Hall served first as a refuge for British children who had been sent to Canada to escape the London bombings and later the Royal Canadian Navy was given use of the house and grounds as a burn convalescent hospital and rehabilitation centre. Lady Eaton donated the funds for all the medications and staff. At war's end, Eaton Hall returned to its role as a private residence and working farm. By 1971 it was purchased and used by one of Canada's outstanding community colleges, Seneca College. By the summer of 1991 it became a more public hotel and conference centre and is a popular destination for corporate meetings. Eaton Hall is likely now the second largest castle/chateau in The GTA. Any guesses on what the #1 castle is? You'll see it in a future episode of TLTV. Stay tuned! On St. Clair Avenue, about 1km east on Yonge Street, there is a beautiful white bridge that spans the Vale Of Avoca ravine. Most commuters and pedestrians simply take it for granted as they go about their day, but they are missing something. A path off of Avoca Avenue takes us near the side of the bridge where it becomes clear that it is an area that often houses a few of Toronto's homeless. The path also takes us down below into the valley where we can get up close to the bottom of the bridge to see it's great black metal spans that cross the bubbling stream below. The path and wooden walkways take us past some very colourful graffiti and interesting signs of life. In the sixth episode from Kincardine we'll visit a soybean farm on a warm summer afternoon. You'll hear the bugs chirping, see old rusting farm equipment, and watch the breeze blowing the crops and grass. In the fifth episode from Kincardine Ontario we'll head back to Boiler Beach to enjoy a spectacular Ontario sunset. Watch as the sun sets over Lake Huron and the crescent moon rises in the nights sky. Enjoy! Are you interested in life in the GTA (Greater Toronto Area)? Well then this site is for you! We have numerous short 5-10 minute high definition videos of daily life in the GTA. Tune in ... it's free and easy to use! The finished movie file is available in the format MPEG4 H.264 Widescreen 720P HD which is compatible with most HD video players.